The extent of the historical basis of the Homeric epics has been a topic of scholarly debate for centuries. While researchers of the 18th century had largely rejected the story of the Trojan War as fable, the discoveries made by Heinrich Schliemann at Hisarlik reopened the question in modern terms, and the subsequent excavation of Troy VIIa and the discovery of the toponym "Wilusa" in Hittite correspondence has made it plausible that the Trojan War cycle was at least remotely based on a historical conflict of the 12th century BC, even if the poems of Homer are removed from the event by more than four centuries of oral tradition. In antiquity, educated Greeks accepted the truth of human events depicted in the Iliad and Odyssey, even as philosophical scepticism was undermining faith in divine intervention in human affairs. In the time of Strabo, topographical disquisitions discussed the identity of sites mentioned by Homer. This continued when Greco-Roman culture was Christianised: Eusebius of Caesarea offered universal history reduced to a timeline, in which Troy received the same historical weight as Abraham, with whom Eusebius' Chronologia began, ranking the Argives and Mycenaeans among the kingdoms ranged in vertical columns, offering biblical history on the left (verso), and secular history of the kingdoms on the right (recto). Jerome's Chronicon followed Eusebius, and all the medieval chroniclers began with summaries of the universal history of Jerome. With such authorities accepting it, post-Roman Europeans continued to accept Troy and the events of the Trojan War as historical. Geoffrey of Monmouth's pseudo-genealogy traced a Trojan origin for royal Briton descents in Historia Regum Britanniae. Merovingian descent from a Trojan ancestor was embodied in a literary myth first established in Fredegar's chronicle (2.4, 3.2.9), to the effect that the Franks were of Trojan stock and adopted their name from King Francio, who had built a new Troy on the banks of the river Rhine (modern Treves). However, even before the so-called Age of Enlightenment of the 18th century these supposed facts of the medieval concept of history were doubted by Blaise Pascal: "Homer wrote a romance, for nobody supposes that Troy and Agamemnon existed any more than the apples of the Hesperides. He had no intention to write history, but only to amuse us." During the 19th century the stories of Troy were devalued as fables by George Grote. The discoveries made by Heinrich Schliemann at Hisarlik revived the question during modern times, and recent discoveries have resulted in more discussion. According to Jeremy B. Rutter, archaeological finds thus far can neither prove nor disprove whether Hisarlik VIIa was sacked by Mycenean Greeks sometime between 1325 and 1200 BC. No text or artifact found on the site itself clearly identifies the Bronze Age site by name. This is due probably to the leveling of the former hillfort during the construction of Hellenistic Ilium (Troy IX), destroying the parts that most likely contained the city archives. A single seal of a Luwian scribe has been found in one of the houses, proving the presence of written correspondence in the city, but not a single text. Research by Anatolian specialists indicates that what is called "Troy" was in the Late Bronze Age known to the Hittites as the kingdom of Wilusa, and that it appears that there were several armed conflicts in the area at the end of the Late Bronze Age, although this does not identify the combatants. The bilingual toponymy of Troy/Ilion is well established in the Homeric tradition. The Mycenaean Greeks of the 13th century BC had colonized the Greek mainland and Crete, and were beginning to make forays into Anatolia. Philologist Joachim Latacz identifies the "Achaioi" of the Illiad with the inhabitants of Ahhiyawa. He posits that in all probability the Iliad preserved through oral hexameters the memory of one or more acts of aggression perpetrated by the Ahhiyawans against Wilusa in the thirteenth century B.C. The more that is known about Bronze Age history, the clearer it becomes that it is not a yes-or-no question but one of educated assessment of how much historical knowledge is present in Homer, and whether it represents a retrospective memory of Dark Age Greece, as Finley concludes, or of Mycenaean Greece, which is the dominant view of A Companion to Homer, A.J.B. Wace and F.H. Stebbings, eds. (New York/London: Macmillan 1962). The particular narrative of the Iliad is not an account of the war, but a tale of the psychology, the wrath, vengeance and death of individual heroes, which assumes common knowledge of the Trojan War as a back-story. No scholars now assume that the individual events of the tale (many of which involve divine intervention) are historical fact; however, no scholars claim that the story is entirely devoid of memories of Mycenaean times. However, in addressing a separate controversy, Oxford Professor of Greek, Martin L. West indicated that such an approach "misconceives" the problem, and that Troy probably fell to a much smaller group of attackers in a much shorter time. Some archaeologists and historians, most notably, until his death in 1986, Finley,[note 1] maintain that none of the events in Homer's works are historical. Others accept that there may be a foundation of historical events in the Homeric narrative, but say that in the absence of independent evidence it is not possible to separate fact from myth. Finley, for whom the Trojan War is "a timeless event floating in a timeless world",:172 analyzes the question of historicity, aside from invented narrative details, into five essential elements: 1. Troy was destroyed by a war; 2. the destroyers were a coalition from mainland Greece; 3. the leader of the coalition was a king named Agamemnon; 4. Agamemnon's overlordship was recognized by the other chieftains; 5. Troy, too, headed a coalition of allies. Finley does not find any evidence for any of these elements.:175ff. Aside from narrative detail, Finley pointed out that, aside from some correlation of Homeric placenames and Mycenaean sites,[note 2] there is also the fact that the heroes lived at home in palaces (oikoi) unknown in Homer's day; far from a nostalgic recall of the Mycenaean age, Finley asserts that "the catalog of his errors is very long". What the poet believed he was singing about was the heroic past of his own Greek world, Finley concludes. During recent years scholars have suggested that the Homeric stories represented a synthesis of many old Greek stories of various Bronze Age sieges and expeditions, fused together in the Greek memory during the "dark ages" which followed the end of the Mycenean civilization. In this view, no historical city of Troy existed anywhere: the name perhaps derives from a people called the Troies, who probably lived in central Greece. The identification of the hill at Hisarlık as Troy is, in this view, a late development, following the Greek colonisation of Asia Minor during the 8th century BC. It is also worth comparing the details of the Iliadic story to those of older Mesopotamian literature—most notably, the Epic of Gilgamesh. Names, set scenes, and even major parts of the story, are strikingly similar. Some academics believe that writing first came to Greece from the east, via traders, and these older poems were used to demonstrate the uses of writing, thus heavily influencing early Greek literature. Map of the Troad (Troas). Another opinion is that Homer was heir to an unbroken tradition of oral epic poetry reaching back some 500 years into Mycenaean times. The case is set out in The Singer of Tales by Albert B. Lord, citing earlier work by folklorist and mythographer Milman Parry. In this view, the poem's core could represent a historical campaign that took place at the eve of the decline of the Mycenaean civilization. Much legendary material may have been added, but in this view it is meaningful to ask for archaeological and textual evidence corresponding to events referred to in the Iliad. Such a historical background gives a credible explanation for the geographical knowledge of Troy (which could, however, also have been obtained in Homer's time by visiting the traditional site of the city, which was in fact New Ilium, built at the base of the hill at Hisarlık) and otherwise unmotivated elements in the poem (in particular the detailed Catalogue of Ships). Linguistically, a few verses of the Iliad suggest great antiquity, because they only fit the meter if projected back into Mycenaean Greek, in part due to the classical loss of the digamma; this trace of archaic language suggests a poetic tradition spanning the Greek Dark Ages. On the other hand, there are well-known interpolations in the text we have. 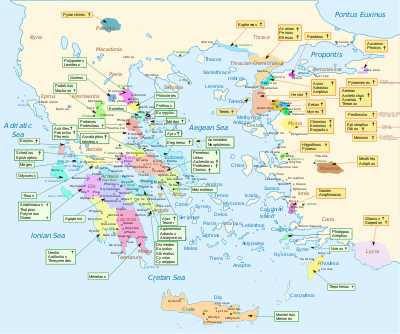 Even though Homer was Ionian, the Iliad reflects the geography known to the Mycenaean Greeks, showing detailed knowledge of the mainland but not extending to the Ionian Islands or Anatolia, which suggests that the Iliad reproduces an account of events handed down by tradition, to which the author did not add his own geographical knowledge. As mentioned above, though, it is most likely that the Homeric tradition contains elements of historical fact and elements of fiction interwoven. Homer describes a location, presumably in the Bronze Age, with a city. This city was near Mount Ida in northwest Turkey. Such a city did exist, at the mound of Hisarlık. Likewise, in the Mycenaean Greek Linear B tablets, some Homeric names appear, including Achilles (Linear B: 𐀀𐀑𐀩𐀄, a-ki-re-u),[note 3] a name which was also common in the classical period, noted on tablets from both Knossos and Pylos. The Achilles of the Linear B tablet is a shepherd, not a king or warrior, but the very fact that the name is an authentic Bronze Age name is significant. These names in the Homeric poems presumably remember, if not necessarily specific people, at least an older time when people's names were not the same as they were when the Homeric epics were written down. Some story elements from the tablets appear in the Iliad. The first person to point to the Hittite texts as a possible primary source was the Swiss scholar Emil Forrer in the 1920s and 1930s. In discussing an ethnic group called the Ahhiyawa in these texts, Forrer drew attention to the place names Wilusa and Taruisa, which he argued were the Hittite way of writing (W)ilios (Ilios) and Troia (Troy). He also noted the mention of a Wilusan king Alaksandu, who had concluded a treaty with the Hittite king Muwatalli; the name of this king closely resembled Alexandros/Alexander, the alternative name of Paris, the son of king Priam. Other identifications Forrer offered included Priam with Piyama-Radu, and Eteocles, king of Orchomenos, with one Tawagalawa. However, despite his arguments, many scholars dismissed Forrer's identification of Wilusa-(W)ilios/Troia-Taruisa as either improbable or at least unprovable, since until recently the known Hittite texts provided no clear indication where the kingdom of Wilusa was located beyond somewhere in Western Anatolia.:394ff. Despite this evidence, the surviving Hittite texts do not provide an independent account of the Trojan War. The Manapa-Tarhunda letter is about a member of the Hittite ruling family, Piyama-Radu, who gained control of the kingdom of Wilusa, and whose only serious opposition came from the author of this letter, Manapa-Tarhunda. King Muwatalli of the Hittites was the opponent of this king of Troy, and the result of Muwatalli's campaign is not recorded in the surviving texts. :245–247 The Ahhiyawa, generally identified with the Achaean Greeks,:59–63 are mentioned in the Tawagalawa letter as the neighbors of the kingdom of Wilusa, and who provided a refuge for the troublesome renegade Piyama-Radu. :321–324 The Tawagalawa letter mentions that the Hittites and the Ahhiyawa fought a war over Wilusa. In November 2001, geologists John C. Kraft from the University of Delaware and John V. Luce from Trinity College, Dublin presented the results of investigations into the geology of the region that had started in 1977. The geologists compared the present geology with the landscapes and coastal features described in the Iliad and other classical sources, notably Strabo's Geographia. Their conclusion was that there is regularly a consistency between the location of Troy as Hisarlik (and other locations such as the Greek camp), the geological evidence, and descriptions of the topography and accounts of the battle in the Iliad. ^ Finley vigorously attacked Michael Wood's In Search of the Trojan War when it first appeared in 1984, four years before modern archaeology was undertaken at the Hisarlik site. ^ The word a-ki-re-u which is found on the KN Vc 106 tablet, has been identified as Akhilleus. ^ Analysed in Francis Ingledew, "The Book of Troy and the Genealogical Construction of History: The Case of Geoffrey of Monmouth's Historia regum Britanniae" Speculum 69,.3 (July 1994:665-704). ^ Peter G. Bietenholz, Historia and Fabula: Myths and Legends in Historical Thought 1994:190. ^ Pascal, Pensées (published 1660), part ix, §628. ^ In Grote, A History of Greece, vol. I (1846), "Legendary Greece" prefaces "Historical Greece to the reign of Peisistratus", and begins the "historical" section with the traditional date of the first Olympiad, 776 BC: "To confound together these disparate matters is, in my judgement, essentially unphilosophical. I describe the earlier times by themselves, as conceived by the faith and feeling of the first Greeks, and known only through their legends,—without presuming to measure how much or how little of historical matter these legends may contain" (Preface). The "Legend of Troy"—"this interesting fable"—fills his chapter xv. ^ a b c d e f Finley, Moses I. (1978). The World of Odysseus. ^ Martin West, The East Face of Helicon (Oxford 1999), pp. 336-338; T.B.L. Webster, From Mycenae to Homer (London 1958) pp. 82, 119ff. ^ "5. Homer as an Oral-Traditional Poet". chs.harvard.edu. Retrieved 2019-01-19. ^ France-Presse, Agence (2015-08-26). "Ancient Greek palace unearthed near Sparta dates back to 17th century BC". The Guardian. ISSN 0261-3077. Retrieved 2019-01-19. ^ Conant, Craig; Thomas, Carol G. (2005). The Trojan War. Westport, Conn: Greenwood Press. p. 105. ISBN 0-313-32526-X. ^ Castleden, Rodney (2005). "The Trojan War". Mycenaeans. New York: Routledge. p. 199. ISBN 0-415-24923-6. ^ a b c d e Bryce, Trevor (1998). The Kingdom of the Hittites. Oxford: Clarendon Press. ^ Thomas, Neil (3 March 2003). "Geology corresponds with Homer's description of ancient Troy". U Daily (University of Delaware). Retrieved 6 August 2011. The Greek Age of Bronze "Trojan War"